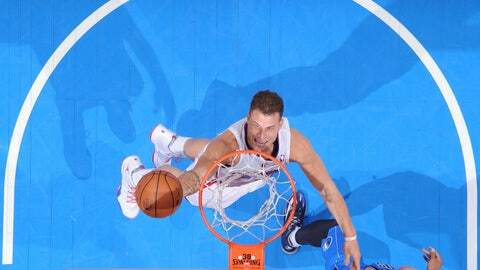 The Clippers are 10-11 on the road this season, 4-6 against Eastern Conference teams. The Clippers continue their Grammy road trip with four games in six nights starting Monday in Detroit. Remaining games are Wednesday at Charlotte, Friday at Chicago and Saturday at Toronto. Of that group, only Toronto (20-19) has a winning record. The Clippers are 10-11 on the road this season, 4-6 against Eastern Conference teams. The Clippers went 2-1, coming up with a late rally last Wednesday to beat Dallas at Staples Center, then opening their trip with an impressive victory over the New York Knicks at Madison Square Garden. Saturday night’s clunker at Indiana, a 106-92 loss, was an indication the Clippers remain short of the NBA’s upper echelon. One game into the second half of the regular season, the Clippers are 28-14 and own a two-game lead over the Golden State Warriors (26-16) in the Pacific Division. They also remain fourth in the Western Conference, guaranteeing a first-round home series if the playoffs began today. Center DeAndre Jordan is continuing to prove he’s worthy of All-Star game consideration. He had 13 rebounds and two blocked shots against the Mavericks; 16 rebounds, three blocks and 11 points against the Knicks; and 17 rebounds, two blocks and 12 points against the Pacers. Health is likely going to be the Clippers’ most significant issue in the second half. Point guard Chris Paul is still down with a separated right shoulder, but three more players were hurt Saturday at Indiana: Darren Collison (sprained left big toe), J.J. Redick (swollen left knee) and Matt Barnes (sprained left thumb). The team confirmed all three will be available Monday. Newly signed 6-foot-10 forward Hedo Turkoglu could play an important role off the bench if injuries reduce the Clippers’ roster this week. He’s clearly not in game shape after playing six minutes against the Knicks and 13 against the Pacers, but in the time he’s been on the court, Turkoglu has shown to be an accurate shooting, making all three of his shot attempts. The Clippers aren’t the best three-point-shooting team in the league, but when they put up a lot of long-distance shots it’s usually a formula for success. They made 17 against Dallas, only the second time in franchise history they’ve made 17 or more in a game, but consider this statistic: When they make at least nine three-pointers in a game, they’re 17-0. "We’ve been incomplete in a lot of ways, so we haven’t been complete as a group yet." — coach Doc Rivers to the L.A. Times, speaking about the team’s injuries this season.